The Naruto whirlpools (鳴門の渦潮, Naruto no Uzushio) are tidal whirlpools in the Naruto Strait, a channel between Naruto in Tokushima and Awaji Island in Hyōgo, Japan. The strait between Naruto and Awaji island has a width of about 1.3 km (0.81 miles). 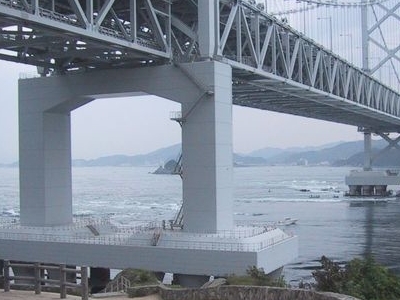 The strait is one of the connections between the Pacific Ocean and the Inland Sea, a body of water separating Honshū and Shikoku, two of the main islands of Japan. The tide moves large amounts of water into the Inland Sea twice per day and also removes large amounts of water twice a day. With a range of up to 1.7 m (5.6 ft), the tide creates a difference in the water level of up to 1.5 m (4 ft 11 in) between the Inland Sea and the Pacific. Due to the narrowness of the strait, the water rushes through the Naruto channel at a speed of about 13–15 km/h (8–9 mph) four times a day, twice flowing in and twice flowing out. During a spring tide, the speed of the water may reach 20 km/h (12 mph), creating vortices up to 20 m (66 ft) in diameter. The current in the strait is the fastest in Japan and the fourth fastest in the World after the Saltstraumen outside Bodø in Norway, which reaches speeds of 37 km/h (23 mph), the Moskenstraumen off the Lofoten islands in Norway (the original maelstrom), which reaches speeds of 27.8 km/h (17.3 mph); and the Old Sow whirlpool in New Brunswick, Canada, which has been measured with a speed of up to 27.6 km/h (17.1 mph). Here's the our members favorite photos of "Natural Features near Honshu". Upload your photo of Naruto Whirlpools! 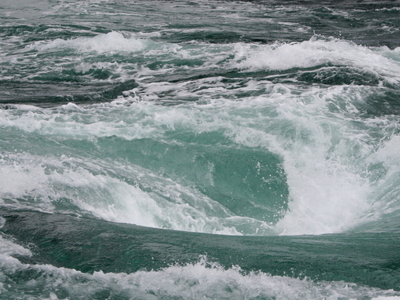 Riefa Astarina is the only Touristlink member to visit Naruto Whirlpools. Have you been here? Click here to save it.